Contact Us For Email Response! We will call you soon! 936-661-2624 and Scott, 936-662-5043. Call today! Fishhawk Lake Real Estate-Things to Do When Turning Fifty or Sixty! Gayle Rich-Boxman tells us here, these are things we can do! We are the Boomers and We Rule! It is our world and it's time to realize that we are IMPORTANT! We have lived and can teach, we have lived and can do, we have lived and have much more living to do! Listen and learn from Gayle. She Rocks! I love this book called God Never Blinks and the author, Regina Brett has put together short chapters based on articles she wrote for years on life lessons for the the Cleveland Plain Dealer. This morning I opened up to Chapter 36, Growing Old Beats the Alternative. Dying Young Looks Good Only in Movies. She beat cancer after getting it at age 41. So she wrote about turning fifty and made some great suggestions about what to do to stay young. Give a genuine compliment to a person you don't know who is at least 80--I guarantee they'll be delighted! Eat 50-60 pieces of your favorite candy (maybe spread it out a bit!) Regina suggests M&Ms. Write about your life's mission in 50-60 words. *Drive 50-60 miles on back roads you've never been on before. Don't take a map and don't check your GPS. Let the road lead you. Blow up balloons and instead of tying them off, let them go so they whiz around the room. Have a pillow fight with some of your grandkids, or even some of your bestfriends! Reflect on what you would say to 50-60 people in your life about how you've learned to "stay young"
Write the first 50-60 pages of that novel that you've always wanted to write! *Write down 50-60 wishes for the future--small ones and big ones, wild ones and tame ones--put them in a jar, and don't read them until your next birthday. Take a 50-60 minute hike out in nature. Don't wait til you're 50-60 to do these things! Do it at 35, 40, 19!!! "Your Gateway to the Lake!" 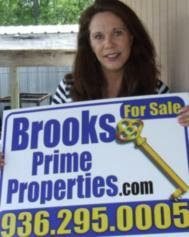 Wichita Falls Real Estate and Home Sales by Deb "Alayne" Brooks! Check out my website at: www.debs-realestate.com. POSITIVE THINGS TO DO WHEN THE LAKE LEVELS ARE LOW! When The Lights Went Out In Kindergarten!